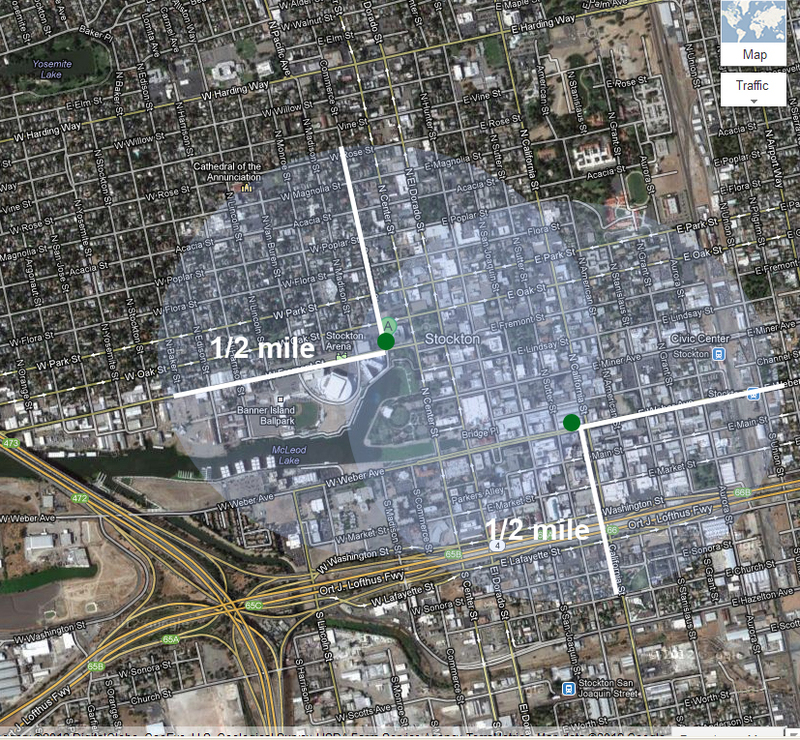 You are here: Home » Can Metro Express foster Transit Oriented Development in Stockton? With the introduction of Bus Rapid Transit, Stockton residents now have an efficient and effective method of transportation along some of the city’s most vital corridors. Metro Express’s amenities put it on par with many other Bus Rapid Transit systems around the country, and city riders have taken advantage, pushing ridership numbers to heights not seen before on regular bus routes. While it is easy to see how Metro Express gives Stocktonians a better choice for transportation, the potential benefits to the community from Stockton’s new transportation option extend beyond simply getting people from point A to point B. With the apparent success of Bus Rapid Transit, the door is now open to an intriguing possibility that many have probably never thought could take hold in Stockton: Transit Oriented Development. The mention of Transit Oriented Development (TOD for short) generally conjures up images of soaring buildings around bustling and crowded subway stations. The case in Stockton for TOD is much less dramatic, but nevertheless has the potential to change development patterns in the city for the better. Before jumping into how TOD can take hold in Stockton, it is important to understand exactly what the differences are between TOD and regular development, as well as TOD’s potential benefits. As opposed to traditional subdivisions, TOD projects are centered around transportation hubs such as light rail, subway, and train stations and even bus stops. Because of the nature of most transportation systems, these developments generally take place as infill development (that is, development within existing city limits) and often include the reutilization of existing buildings or structures. These projects also include mixed uses, such as commercial, retail and residential, as opposed to sticking to one single use, which has traditionally been the case for new developments in Stockton. The benefits of investing in TOD are numerous and include reduction of vehicle miles traveled, reduced emissions and increased mobility for youth and seniors. Also, because TOD usually occurs as infill development, green space is spared. The development of these types of mixed-use projects has even been linked to fostering greater community interaction. All of these are inherent benefits of denser, infill development that I have espoused before over the structural inefficiencies of sprawl. The benefits of TOD are not limited to major rail projects, either; Bus Rapid Transit (BRT) has been credited with being a catalyst for economic development in many cities. The Government Accountability Office (GAO) examined BRT lines across the country (as noted in last week’s post) and found that many officials directly credited BRT with spurring development along BRT routes. For example, Cleveland officials estimate between $4 and $5 billion (with a B) worth of investment has occurred along the corridor of their new Healthline BRT route. These officials feel the benefits of BRT are just as profound as what a light rail line would have brought, and at a fraction of the cost. The GAO report does note that BRT alone does not magically create development, citing several other factors such as the presence of major institutional centers (i.e. hospitals, activity centers, universities) as a key to successful BRT developments. 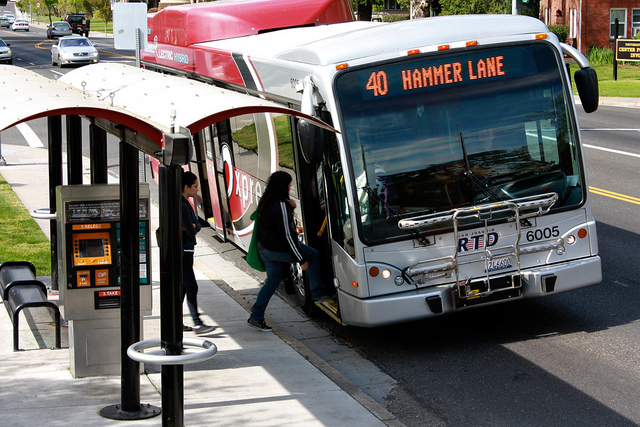 Luckily, Stockton’s BRT is not a bus to nowhere, with Route 40 whizzing past the established institutions of Delta College and the University of the Pacific on the way to downtown while the new Route 43 includes stops at Kaiser Permanente and Sutter Gould Medical offices. As we have established, TOD has real benefits, and Stockton’s Metro Express has the potential to foster these kinds of developments. But how do you get developers to buy in? There is tons of green space, it is much easier to just build more sprawl than it is to think innovatively about creating new projects within the city. Luckily, the state of California has taken some innovative steps to try and encourage more TOD type projects, and less sprawl. With the passage of SB 375 in 2008, the state’s innovative (though not entirely effective) land use law, there are some pretty significant incentives now in place making infill development near transportation hubs more attractive to cities and developers. Specifically, the law allows certain projects to bypass part or all of the California Environmental Quality Act (CEQA), the state’s environmental protection and impact law. While the spirit of this law is noble, to protect the state’s environment, the CEQA process has been known to be a cumbersome barrier to projects of all sizes as the environmental review process can be quite costly. However, projects that meet specific criteria laid out in SB 375 are eligible for an expedited environmental review process. These criteria include having a certain percentage of residential units per acre, utilization of existing utilities, and efficiency standards, to name a few. For Stockton, the most striking criteria may be the inclusion of projects that are within a half mile of a bus stop that has at least 15-minute headways (the time interval between buses moving in the same direction on a particular route). Since Stockton’s Metro Express features 10 minute headways during most hours, it appears that projects within a half mile of Metro Express stops (if they met the other criteria listed) qualify for CEQA streamlining or exemption. (For a very nice summary of all of the criteria for CEQA exemption as well as an overview on SB 375, Bill Fulton does a nice job here). While CEQA exemption is not the only barrier to infill development, it is a significant one, and with SB 375 clearing the way for smart, sustainable development a long BRT routes, the possibility of transit oriented development becomes one step closer to reality. Of course, TOD’s are realized through strong collaborations between developers, local governments and transit agencies. For Stockton to take advantage of the opportunities presented, we will have to see a stronger commitment to changing our growth patterns than we have traditionally seen from our leaders and local developers. As you can see, a half mile goes a long way, with these two Metro Express stops covering large swaths of downtown and midtown neighborhoods. Significant parts of the waterfront are included as well, and a CEQA exemption could be a substantial incentive for a developer to create a strong project on the shores of the Deep Water Channel. All of those empty lots downtown are covered as well. But does CEQA streamlining magically mean projects will start springing up along Metro Express routes? No, not at all. AB 375 was passed in 2008, and Metro Express route 40 has been around since 2007. Clearly, there are more factors at work that make investment in TOD a difficult sell. For one, people here have to want this kind of development, and it appears there is support to some extent. In 2011, a group of researchers from the UC Berkeley Center for Future Urban Transport saw Stockton as a potential site for TOD projects along the Metro Express 40 route (their report also features some neat conceptual renderings of what development could look like along Metro Express routes– check it out). As part of the study, researchers polled local stakeholders, and found support for many BRT and TOD features. While very high density concepts were the first choice of respondents, medium density development was viewed favorably. This is an important distinction, because for TOD to be successful in Stockton, densities do not need to hit bay area levels. Three to five story infill projects, by no means sky scrappers, would be a major step up from the low density building we are used to. Stockton’s Metro Express service has proven to be quite popular with residents, showing that Stocktonians are not averse to trying new things. Around the country, the housing crisis and rising fuel costs are forcing individuals to rethink where they live. In Stockton, I think residents are ready to embrace smarter development instead of sprawl. I think it is time we were given that choice.